If the same agent helps both the buyer and the sell of a house, it's called "dual agency" and it's actually a very slippery slope. The same agent is now representing the buyer and the seller. 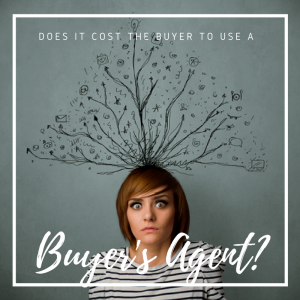 Would you want the same agent whose sole duty it is to sell that house for as much money as possible help you buy the house? It would seem you might not be represented in the most fair way... and you'd be right. But many buyers think that they are already spending a fortune to get into a house, why pay for their own agent? This is the coolest thing about being a buyer in a transaction. Buyer's agents, also called "selling agents" get paid from the sale of whatever home you choose. Here's how that works. When a homeowner decides to sell, they find a real estate agent licensed in their area. Agents can choose to represent buyers or sellers or both if they want. Some agents really love one side or the other but a licensed agent can do either. The homeowner signs a contract with that agent and agrees to sell the property for a set price and help facilitate the transaction for the seller for a commission on the property. That commission is usually 6%. But, this is negotiable. Everything's negotiable. This commission is then split between the listing agent and the agent that brings the buyer. There are creative ways to set this up too. Often the listing agent will take less of a commission and give more to the buyer's agent. This might mean 4% to the buyer's agent (as an incentive to get more agents with buyers interested in the house) and only 2% to the listing agent or split even more, i.e. 3.5% to buyer's agent, 2.5% to the listing agent. There may even be a more complicated split such as 3% to the listing agent for the first $500,000, 1.5% of the commission after the $500,000. This is usually the case for higher priced homes. Imagine getting a 3% commission on a $2 million home! ($60,000!) There are typically more incentives on the buyer's side to get more interest in the property. Whatever will incite or seem attractive to buyers and their agents is what many sellers can do, however, it's up to the buyer to choose the home and the agent representing the buyer will get paid on whatever commission the listing contract states. What if a buyer finds a FSBO? This is not uncommon - a For Sale By Owner property. A buyer may find a home not listed in the MLS and therefore has no listing agent that set up a commission. There are many ways to go about handling this and an experienced agent will no doubt have some great answers but in my own experience you buyer's agent will talk to the homeowner. They may agree to increase the list price or reduce it to cover some commission. Usually there is a workaround because one agent is now handling the whole thing and in many cases, assists the seller along the way. This alone is likely to be worth some compensation but a good negotiator is also what this situation needs. If the seller refuses to pay anything, the agent may ask the buyer to compensate. Here's where it can be tricky; buyer's don't want to have to pay anything but still need guidance and direction. There's so much paperwork involved in a real estate transaction that one little mistake could be costly. Often the agent will increase the cost of the home if possible after coordinating with the financing department and escrow. This should cover some, if not all compensation. It can be awkward though because the agent just can't assist without compensation ... this IS their job after all. So, if you've thought this through you've probably realized that if there is no buyer's agent, the listing agent receives all the commission. Yep, that's true. Now, can you see why many listings agents WANT to be the only agent on the deal. 6% commission is a lot more than 3%. But again, they are not working for the buyer first. Their main objective is to sell that property. Now, listing agents could gain a buyer from the sale, meaning that if the buyer really didn't like that house or the inspection failed, the listing agent could automatically turn into the buyer's agent and help them find another house, collecting the buyer's commission from that sale instead. This is a lot more common and more widely accepted. Blurring the lines between listing agent and buyer's agent on the same property can get sticky. It's best to have your own representation the entire way. Although dual agency is not illegal in most states, it can blur the lines of fiduciary duty to the client. The end result is a well-represented client getting the house or the sale they want. When one agent is fighting for two different things, it's hard to compartmentalize sides. More - What about buying new construction without a real estate agent? So, next time you want to buy a house, or maybe the first time, make sure you get your own agent - all the way. What if I have Buyer's Remorse After I Close? Do I need my own agent when Buying a Condo? Excellent points Tammy. Buyers need to understand the impacts of dual agency.